Should Abusers Be Encouraged To Report Themselves? 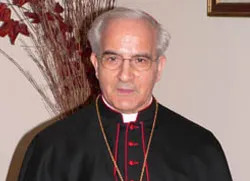 Or at least that’s the answer of Bishop Gianfranco Girotti (pictured) of the Apostolic Penitentiary. A priest who confesses sexual abuse in the sacrament of penance should be absolved and should generally not be encouraged by the confessor to disclose his acts publicly or to his superiors, a Vatican official said. Likewise, the confessor should not make the contents of such a confession public, said Bishop Gianfranco Girotti, regent of the Apostolic Penitentiary, a Vatican court that handles issues related to the sacrament of penance. . . . When a priest confesses such acts, “the confession can only have absolution as a consequence,” he said. Bishop Girotti spoke strictly about the response of a confessor, and not about the wider responsibility to acknowledge and investigate priestly sexual abuse outside the confessional. So he’s not saying that everything possible shouldn’t be done outside the confessional to investigate abuse. He’s dealing with what goes on under the seal of confession, which—among other things—prohibits the confessor from himself revealing the penitent’s sin. “It is not up to the confessor to make them public or to ask the penitent to incriminate himself in front of superiors. This is true because, on one hand, the sacramental seal remains inviolable and, on the other hand, one cannot provoke mistrust in the penitent,” he said. “From the confessor, (the penitent) can only expect absolution, certainly not a sentence nor the order to confess his crime in public,” he said. In the first quotation Bishop Girotti seems to be saying that (a) the confessor cannot make the sins public because of the seal and (b) he should not ask the penitent to incriminate himself because to do so would provoke mistrust in the penitent. (a) is very certainly true. (b) would seem to be questionable. In the second quotation Bishop Girotti refers to “a sentence” and “the order” to confess publicly. There may be a translation issue here, but he may be alluding to one of a number of things. Perhaps by “a sentence” he means (c) sentencing the penitent to self-incriminate as part of the act of penance required for absolution. Perhaps by “the order” he refers to (d) demanding that the penitent self-incriminate but not as a condition of absolution. If he is saying that a confessor must not require the penitent to self-incriminate as a condition of absolution then he is absolutely correct. If that were possible then any priest in the world would be able to circumvent the seal of confession by simply requiring penitents to publicly self-incriminate. It would defeat the whole purpose of the seal. While public self-accusation was sometimes practiced in the early years of the Christian faith, the pastoral experience of the Church has been that it is much more pastorally advisable to assure penitents that they will not be publicly exposed, which is why the seal was created in the first place. To require penitents to publicly reveal their sins would defeat its whole purpose. So the priest could not sentence a penitent to self-incrimination as a requirement of absolution. Could he order him to self-incriminate? For lack of ability to order the penitent to do something, the most the confessor would be able to do would be to implore, encourage, urge, etc., the penitent to self-incriminate, either before Church or civil authorities. To what extent should he do that? Here there is room for debate. From the news story, Bishop Girotti appears to think that this should not generally be done out of concern that it could alienate the penitent—to discourage him from seeking God’s mercy in the way that is ordinarily required for the forgiveness of mortal sin. To answer the question one would need to take into account both the goods to be achieved by encouraging the penitent to turn himself in and the harms that could result. So I’m wondering what the readers think. How strongly and in what circumstances should a confessor urge a penitent to turn himself in? Does it matter whether the penitent is a priest or a layman? If it is you? Does it matter whether the sin is sexual abuse or something else? What sins should be ones that a confessor encourages self-incrimination for? What ones shouldn’t he? How can we distinguish the two? And what would happen to your willingness to go to confession if you knew you would meet with a strong encouragement to self-incriminate?